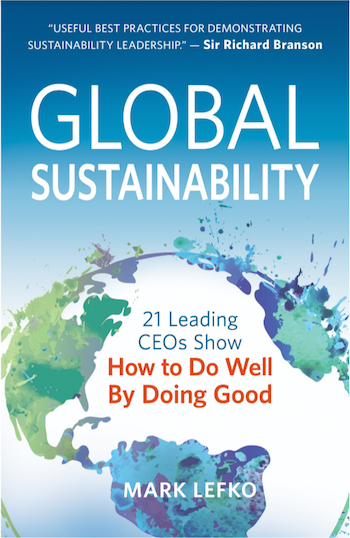 We recently had the pleasure of reading Mark Lefko’s new book Global Sustainability: 21 CEOs Show How to Do Well by Doing Good. Mark is an internationally renowned thought leader who coaches the world’s top corporate CEOs, presidents and executives on sustainable business strategy and working synergistically with their teams. We also appreciated the insight shared on conscious leadership which Mark defines as “leading with the awareness that whatever we say or do has an impact on everyone and everything around us.” A conscious leader is also someone who embraces the triple bottom line and has a purpose that drives him or her. Ultimately, it’s the consciousness of the leaders that creates the culture of the organization. To learn more about how to implement an effective global sustainability strategy visit www.marklefko.com or buy Global Sustainability from Amazon.com.